Transmits the steering switch signal to NAVI control unit. 1. Disconnect NAVI control unit connector and spiral cable connector. 2. Check continuity between NAVI control unit harness connector and spiral cable harness connector. 3. Check continuity between NAVI control unit harness connector and ground. NO >> Replace spiral cable. Refer to SR-16, "Exploded View". 1. Connect NAVI control unit connector and spiral cable connector. 3. 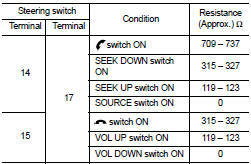 Check voltage between NAVI control unit harness connector. NO >> Replace NAVI control unit. Refer to AV-84, "Removal and Installation". 2. Check steering switch. Refer to AV-72, "Component Inspection". NO >> Replace steering switch. Refer to AV-91, "Exploded View".